Does your company still distribute paper documents for review and approval? Consider using the paperless features within a ProCalV5 system to manage the process. Watch our newest video below to learn more! Avoid the time consuming delays and the uncertainties of distributing documents for review and approval signatures. Approving, archiving and retrieval of important documents and logs to historical events can be easily managed within ProCalV5. The review/approval process for master records and calibration event records in a large organization can be a constant source of frustration, inefficiency and compliance headaches due to tardy signing response and the occasional missing or lost paper record. A truly paperless calibration solution manages all record review/approval processes electronically. ProCalV5 provides both in-application and e-mail reminders to next in-line signatories. Each record in the review/approval process is constantly monitored for progress against the predefined approval policy in effect for that group of records, automatically and immediately putting completed approved records into production use. The ProCalV5 e-mail reminder utility can cut the average approval cycle from weeks/months to days. ProCalV5 approval policies also ensure that the right groups in the organization are part of the process, heightening the level of awareness and compliance. An unlimited number of required signatures can be defined, with each one associated with a configurable set of User Groups. 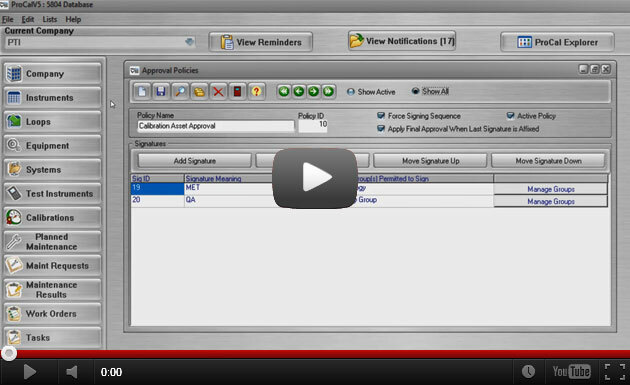 Signatories can be configured to be notified simultaneously or in a fixed sequence. The Reminders system acts as a routing method for approval fields that require review and signing by responsible users. Need help with your system? We are always here to assist! All courses are hands-on and promote active participation to help ensure your organization's success!! Click Here To Get Started With Training!